The quality installation and regular servicing of fall protection equipment is just as important as specifying the right equipment in the first place, says Stuart Pierpoint, UK Sales Manager for HCL. When you’re looking to minimise the risks faced by those working at height, there are three key issues that you need to address. Firstly, you need to specify the correct, high-quality fall protection systems and equipment. Then, you need to make sure that your system is properly installed and then regularly inspected. All three steps go hand-in-hand and are equally important when creating a robust fall protection regime. Giving proper due care and attention to specification, installation and inspection will help to give you ultimate peace of mind. After all, you will have fulfilled your regulatory duties and done your very best to help protect your workforce. The risks of not addressing these issues remain stark. The most recent Health and Safety Executive statistics, for example, show that falls from a height accounted for more than a quarter of all fatal injuries to workers between 2013/14 and 2017/18, at an average of 37 deaths a year. So, what does high-quality fall protection equipment look like and what benefits does it offer compared to non-standard, low quality equipment? Firstly, sophisticated engineering sits at the heart of all high-quality equipment. It’s what enables complex needs to be met while remaining simple to understand, inspect and use. This not only increases the equipment’s functionality, but also reduces the risk of user error. You can rest assured that high-quality equipment will have been subjected to rigorous testing and meets the most stringent safety standards in a wide range of different operating and weather conditions. Quality fall protection equipment also offers superior comfort and functionality, increasing the likelihood that users will wear the equipment and remain comfortable and productive while doing so. While better quality equipment may seem more expensive at the outset, you can look forward to a lower total cost of ownership over the product’s lifetime. Innovative design and sophisticated engineering help future-proof equipment against changing regulatory requirements. The use of high-grade materials also means it’s less prone to damage and deterioration. The next stage in creating a robust fall protection regime is making sure that your system is correctly installed by experienced professionals. Start by checking that the organisation in question uses technicians who all hold CSCS cards. This is particularly important when installing systems on new-build sites. 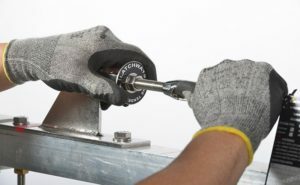 A reputable installer will also be happy to demonstrate how they will guarantee that work will be carried out according to the most stringent safety practices. You should also ask about the installer’s breadth of experience. Fall protection installation requirements can differ greatly from one job to the next, so they need to offer a flexible service and be competent at dealing with a wide range of applications, including retro-fitting fall protection onto older structures. And finally, make sure your chosen installer offers aftercare services and user training. These are all useful indicators of a reputable installer. Once you have specified high-quality fall protection and had it installed by a first-class installer, the final step is to make sure that your system is regularly inspected, certified and serviced. By their very nature, fall protection systems are exposed to harsh operating and climatic conditions, so regular and thorough inspection is vitally important. Hopefully, fall protection systems aren’t called upon often, but when they are, regular servicing and inspection can help your system perform to the very best of its ability. It can also help to identify potential problems at an early stage, allowing you (if safe to do so) to repair rather than replace equipment. Importantly, regular examination helps ensure that you meet the recommendations of the Work at Height Regulations and European Standard EN365, both of which recommend inspection at suitable intervals or every 12 months. By taking a comprehensive, holistic approach to fall protection, you can rest assured that you’re helping to safeguard your workers so that they may return home safely each night. The stakes are too high not to.